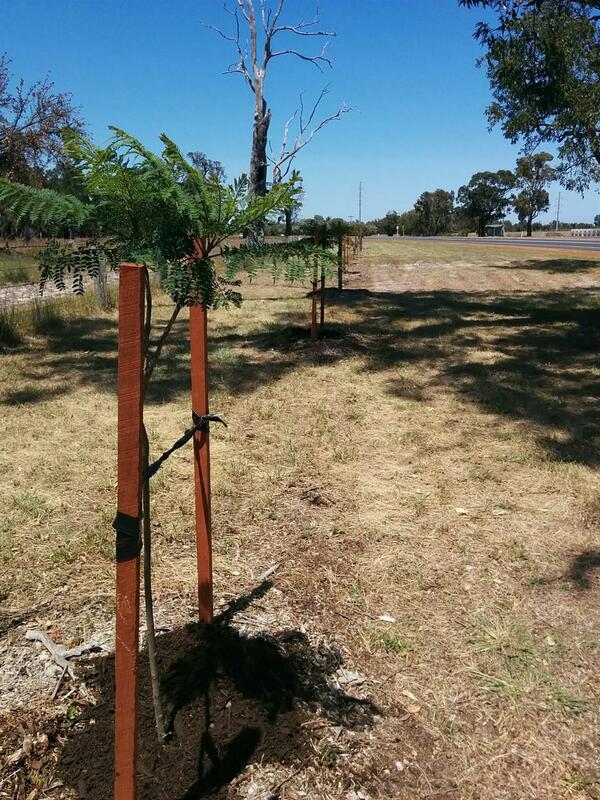 As part of the Club's 50th Anniversary, a row of 100 Jacaranda trees were planted on the road verge at the Southern approach to the town of Pinjarra in July 2017. The trees have grown reasonably well, with only a few having to be replaced since the planting. On Saturday morning (3rd of November), around a dozen members and volunteers from the Rotary Club of Pinjarra spent a couple of hours weeding, staking, mulching, and fertilising the trees in anticipation of the heat of summer. Following the busy bee, many of the tired, thirsty, and hungry volunteers adjourned to the Jarrah Infusion Cafe in Pinjarra ( https://www.jarrainfusion.com/ ) where they were looked after very well. Jarrah Infusion certainly has established itself as one of Pinjarra's excellent venues for patrons to chill out with a coffee and cake or meal in very relaxing surroundings. Replenished with sustenance, the volunteers headed off to attend to the rest of their day, leaving the Jacarandas to their task; to establish themselves and grow into an entry statement to the town of Pinjarra.